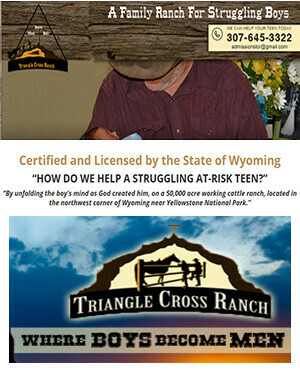 Our Triangle Cross Ranch Program develops the minds, bodies, and souls of troubled troubled teens through active involvement in a ranching environment. At Triangle Cross Ranch Ranch there is a full life cycle in the cattle industry. From birth to the selling of yearling steers, Triangle Cross Ranch helps in the raising of cattle in the traditional cowboy spirit. This has proven true here at Triangle Cross Ranch 307-213-7116. Our horse program does not allow for one horse to be ridden continuously by one person. The old horsemanship philosophy is that “Many horses make a horseman.” The troubled teens learn how to feed, groom and care for the horses soon after they arrive. Some at-risk boys have never been close to a horse—or even seen one in person—and the experience of close contact can contribute greatly to a troubled teen’s healing process. Students ride horses as part of our troubled boys program. Combined with our outdoor work adventure, this helps troubled teens overcome substance abuse. Since Triangle Cross Ranch is not a “Dude” Ranch, we do not recommend that the troubled boy ride our horses while he makes his initial adjustment to the first phase of our program. Trust, work ethic, self-motivation, and a sense of responsibility are key factors in behavior improvement and in determining the troubled teen’s progress as he becomes more closely associated with the horse. Riding a horse has many responsibilities attached to it; successful horsemanship requires many hours of study and a desire to learn about horses. As at-risk boys enter our initial Program they are introduced to a way of living that resembles an 1880’s lifestyle. They live in a log house and cook their food in a log kitchen or outdoors. They also take care of ranch animals including cows, calves, horses, dogs, and cats. They learn how to irrigate crops, grow a vegetable garden, and assist in the harvest of hay and corn. A Life Changing Experience for struggling troubled teens, parents and the entire family. The troubled troubled teen will also learn things about range management, natural spring development, and living the “simple” way of life. During these lifestyle changes, the horse plays an important role in the “Real Life” therapy for the troubled youth. Several staff members here at Triangle Cross Ranch are certified in equine therapy. The horse is used to determine and assist the troubled teen in recognizing his problems and how to deal with them. As a man develops a relationship with his new environment and becomes more knowledgeable and responsible, he will be allowed to experience more of the daily chores and events that make ranch life a maturing and challenging life experience. Triangle Cross Ranch horses are ranch horses in every sense of the word. Please note: Our program is located on a remote rural ranch in back to basics, frontier-style buildings without any frills. If you are looking for luxurious accommodations for your son in a resort-like setting this is not the place to send him! If you want your son to appreciate and not take for granted what has been provided for him by you, then our Ranch is the place to help him grow in appreciation and thanksgiving for all that he has received in his life. troubled teens that engage in our program leave here with a deeper respect for authority, self-discipline, and a new work ethic that will help them be successful in holding down a job or going to college. To learn more about how Equine Therapy at Triangle Cross Ranch can help your troubled boy please call us at 307-213-7116.